In my book the quintessential rustic comfort food is wood fired brick oven pizza. Stylistically it is in a class by itself, decidedly different in flavor and texture than a traditional New York “slice” or Chicago’s “deep dish” iteration. More often than not you will see “Neopolitan” attached to this thin crust style of Italian flat breads, but the genre is not limited to Italy. Many cultures offer their own versions and I would not even attempt to declare my favorite. Corsican’s top their thin crust pizza with a sunny side up egg, and drizzle it with olive oil laced with hot pepperflakes and sprigs of the rosemary that grows wild all over the island. In Alsace it is called flammekuchen – “fired cakes” – and is traditionally topped with roasted onions or better yet forestiere style -with wild mushrooms. A French Florentine variant topped with sauteed spinach, creme fraiche, and escargot will be forever etched in my memory as one of the best meals I have very experienced. But that might have been the wine. But back to Schroon Lake, and why I’m talking about thin crust pizzas. After what seems like years of anticipation, Sticks & Stones finally opened their doors last week in the space that had been occupied by Barry Gregson’s rustic furniture gallery. The restaurant’s new owners had the good sense to ask Barry to finish the new bar, which complements the rest of the interior’s woodwork perfectly. It should because the Gregson brothers did most of it. Eric Gregson finished much of the original space, and their brother Lance’s stone-masonry is on display on the south wall, where his spectacular stone fireplace will warm the dining room on winter evenings. In addition to the selection of rustic pizzas, the kitchen offers a rotating selection of casual family fare like wood fired wings ($9.99), Black Angus beef burger on a rustic pretzel roll ($9.29), fish and chips ($11.99), wild mushroom ravioli with vodka sauce ($18.99), pan seared scallops ($20.99) and “Statler Mountain” chicken breast ($17.99). I love the way they Adirondackized Statler chicken by adding the “Mountain”. Statler or “Airline” chicken is a chicken breast with the drummette of the wing left on (popularized at the Statler Hotel in the 20’s, picked up by the airlines in the 60’s, and now apparently finding a new home in Schoon Lake New York.) Go figure. The outdoor dining patio will be a nice feature this summer. But you are probably not going to Sticks and Stones for the chicken. You are going for the pizzas, which will range in price from $13.29 for a classic margherita to $15.99 for your pick of red sauce or white pizza, cheese, and three toppings. Such a deal. A decent selection of value priced wines can be had to complement your meal. Last night the list offered twenty three bottles to choose from with sixteen of those available by the glass. Most looked to be from the Frederick Wildman catalogue, with Ca’Donini selections anchoring the list as “house” offerings. A good choice by me. I’ll be the tall one at the bar with the Pinot Grigio. 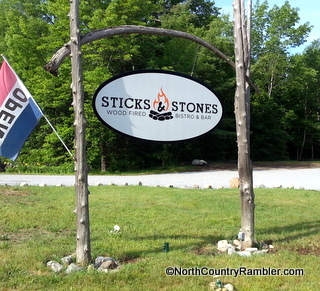 SchroonLaker.com has a nice write-up about Sticks and Stones on their blog. You can read that post here. If you do stop in please let our other readers know about your visit in the comments section.